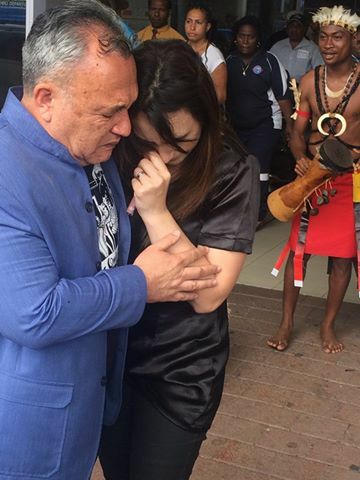 It was an emotional welcome for Rugby Union followers in the country when the wife of former All Blacks great, the late Jonah Lomu arrived at the Jackson's International Airport to a traditional welcome this afternoon. Ms Nadene Lomu is here to officially open the Lomu Legacy Cup when it kicks off tomorrow at the Bava Park. Speaking on arrival, Mrs Lomu said it’s been very overwhelming to come as guest of honor to this tournament since losing her husband. “Receiving an invitation to be part of this inaugural event is a privilege, especially in a country that still embraces the great Jonah Lomu and his iconic sporting career” says Ms Lomu. She said she is really looking forward to officiating the 3 days of rugby 7’s tournament. Gate fee stands at 10 kina for grandstand and K5 for outer stand, while children under the age of 12 are free.